Buying an investment property is one of the best financial investments you can make. With annual rents continuing to increase on average 3% – 4% in many parts of California, and rental vacancy rates at 30-year lows in most parts of California, purchasing an investment property is a great source of additional income. I summarized 4 loan programs below available to help you finance and purchase an investment property. Annual rents have been increasing on average 3% – 4% in most areas of California. As you can see below, just a 4% increase in annual rent can increase a $1,500 monthly rent up to $1,974 in just 8 years, an increase of $474, which is a 32% profit in rental income for an investment property owner. 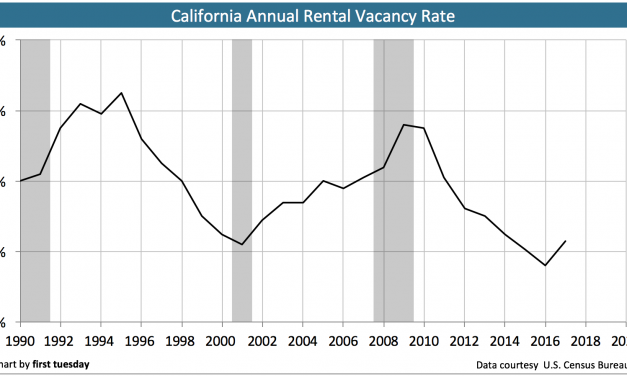 As you can see below, the rental vacancy rates in California are at a 30-year low. With so many desirable places to live in California for renters, coupled with a shortage of affordable housing in many areas, supply and demand will ensure that monthly rents will probably continue to increase for investment property owners. With the continued increase in monthly rents coupled with low rental vacancy rates, buying investment properties can be a very financially rewarding investment for the future. Over the long term, the equity in your property will continue to grow as you pay down your mortgage balance and the home appreciates in value. With interest rates still good, borrowers can still get a low long term fixed rate on their investment property. This is a good idea so the monthly mortgage payment never changes, but the monthly rent will probably continue to increase, which means the return on your investment will continue to increase over the long term. Most investors will use conventional financing to purchase an investment property. Conventional financing allows you to obtain the lowest long term fixed rates, so your monthly return on rental income is highest. The larger the down payment, the lower the rate with conventional financing. The minimum down payment with conventional financing to purchase a single family residence or condo is 15%. You can finance up to a loan amount of $612,150. The minimum down payment to purchase a 2-4 unit property is 25%. You are allowed to finance up to the following loan amounts for a 2-4 unit property. You can finance up to a loan amount of $814,500 on a 2 unit property. You can finance up to a loan amount of $984,525 on a 3 unit property. You can finance up to a loan amount of $1,223,475 on a 4 unit property. No More 50% Owner Occupied Ratios: Fannie Mae eased up their qualifying rules for buyers looking to purchase an investment property condo with conventional financing. Prior to June 23rd, if a complex had <50% owner occupied ratios, and a buyer was trying to purchase a condo as an investment property with conventional financing, the loan was automatically declined. Now as long as a buyer puts down 25% to purchase an investment property, 50% owner occupied ratios are no longer required to qualify for conventional financing. This is going to open up a lot more opportunities for investors to purchase condos in complexes that exist all around California that do not have 50% owner occupied ratios. Fannie Mae made 2 additional changes that will help more investors and buyers purchase condos. 1. Single-Entity Ownership has increased from 10% to 20% for projects with 21 units and more, which means a single investor can own up to 4 units in a 20 unit complex. 2. Project review requirements for 2-4 unit projects are now waived, so no more owner occupied ratio or budge requirements etc for a 3-4 unit property. Did you know the FHA allows you to purchase a 2-4 unit home with FHA financing and you only have to put down 3.5% to qualify? FHA financing is for owner occupied financing, so you would live in one unit and rent out the other 1-3 units. You can also use the rental income from the other 1-3 units to qualify for a loan. This is a great way for homebuyers to start out as a real estate investor. The FHA allows you to finance up to the following loan amounts for a 2-4 unit property. Did you know the VA allows their military buyers to purchase a 2-4 unit home with zero down VA financing? VA financing is for owner occupied financing, so the VA borrower would live in one unit and rent out the other 1-3 units. This is also a great way for VA homebuyers to start out as a real estate investor. A VA homebuyer is allowed to finance up to the following loan amounts for a 2-4 unit property. You can finance up to a loan amount of $784,700 on a 2 unit property. You can finance up to a loan amount of $948,500 on a 3 unit property. You can finance up to a loan amount of $1,178,750 on a 4 unit property. There are lots of new financing options available for buyers who cannot qualify for any of the 3 financing options above. We have bank statement and stated programs available for self employed and W2 buyers. Bank statement programs are great for self employed buyers who don’t show enough net income on their taxes, as we can use their monthly deposits to qualify. If you need financing to purchase an investment property and rehab it, I can help you with the financing. I have access to several private money sources that will allow you to finance up to 90% of the purchase price, and then also give you the additional cash to rehab the property. The financing terms are also some of the lowest in the industry. Once the property has been remodeled and rehabbed, I can help you refinance into a regular conventional loan with a low fixed rate. For the conventional refinance, we will use the NEW higher appraised value for determining the interest rate, so the higher the property value and the lower the loan-to-value, the lower the conventional interest rate will be. Contact me to discuss any projects you are interested in financing. It is still a good time to purchase an investment property in this market, as the cost of borrowing money to finance a home is still historically very low. With rising rents and low rental vacancy rates, buying an investment property is a great long term investment. Buying an investment property is also a great source of additional income for the future. Think of your retirement years, this is what many retirees are using to supplement their retirement income these days. Now is a good time to get out there and shop for homes. Buyers who purchase homes in the spring note there is less competition, so you can negotiate better terms with the seller. If you have any questions about any of this information above, please feel free to contact me directly at 858-442-2686. I look forward to chatting soon.